Ok, so, I've decided to move my scheduled giveaways from my Facebook author page to here! Exciting right? :) I hope so! 1. Scheduled giveaways are as follows - Thursday, October 27th, Thursday, November 17th, Tuesday, November 29th, and Monday, December 19th (there will be 2 winners on 12/19). 6. Don't forget to send me your email address! Send to author.k.hagen@gmail.com with GA1 in the subject line. "Don't have a Kindle? Then enter to win a shiny new Kindle from the good folks at CIAN and CWW. Entering is simple; register for their monthly newsletter where you will receive updates about sales, free books, new releases and giveaways! You'll find the link to giveaway below. 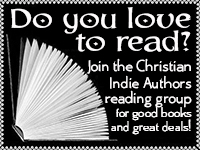 Plus, the Christian Indie Author Network has put together a list of amazing books on sale for only 99 cents each!